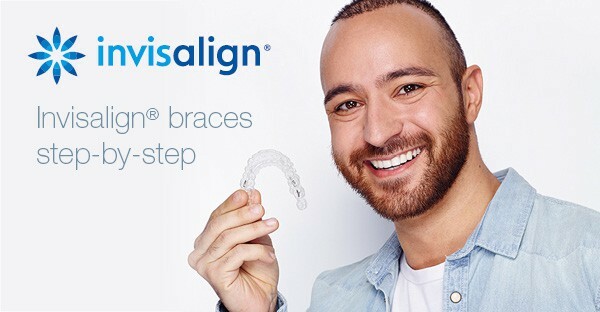 Invisalign® is a very popular orthodontic treatment which focuses on straightening your teeth over a series of clear plastic aligners that are custom designed and fitted to you. Overall the treatment is fast, comfortable and a convenient alternative for straightening your teeth, since the aligners are virtually invisible and require no obstructive metal appliances. Our practice has years of experience providing Invisalign® treatment using sophisticated technology to simulate your new smile. See below to understand the full Invisalign® process. During treatment you will switch to a new aligner every two weeks – meaning there is no pain or discomfort from tightening or adjusting metal supports. It’s advised you wear Invisalign aligners for at-least 20-22 hours per day, only removing the appliance when neccessary for daily activities like eating, drinking and brushing teeth. The entire process can take as little as a few months, up to a year depending on the severity of an individuals case. 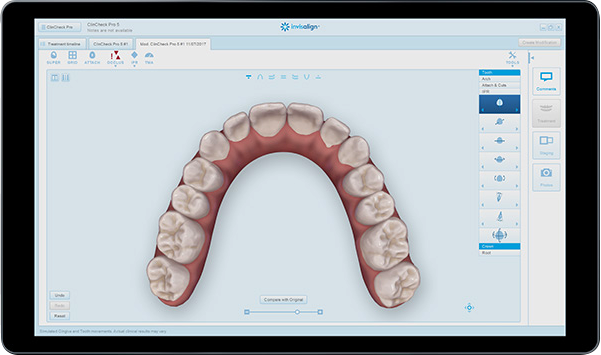 Planning the movements for your teeth is achieved through an advanced software which has been developed over many years from over 5 million Invisalign cases. Integrated Dental Care is equipped with this advanced technology named iTero® or Trios Digital Impression System – which models your teeth in a 3-D environment, indicating what your teeth will look like over the course of treatment. Using this model another complex software called ClinCheck® is used to calculate the series of movements, forces, and pressure required to shift your teeth into place. Allowing Invisalign technicians to create a series of custom aligners which will successfully shift your teeth over the given timeframe. Comfort – Aligners are precisely cut using lasers – meaning there is no obstruction on gums or sensitive tissues. Additionally, the aligners are removable allowing a person to eat, drink, and maintain regular dental habits as normal. Safety – metal braces contain protruding wires and metal which can scratch or puncture the inside of your mouth and gums. Comparatively Invisaligns SmartTrack® material is smooth and comfortable precisely made to reduce damage to sensitive areas such as gums. Duration – With advanced technology and a huge track record of cases, Invisalign®can greatly reduce the treatment time-frame. A treatment plan which focuses on aligning teeth over the smallest possible time-frame. Suitable for patients with mild dental issues or have received orthodontic treatment in the past. Invisalign® LITE is a lower priced solution for less complex orthodontic cases, suitable for patients with minor gaps and crowding. The original Invisalign® product which corrects a larger range of alignment problems. Invisalign Complex provides a solution for fixing almost all orthodontic cases. This treatment plan includes all the characteristics of Invisalign Full with additional features that tackle the unique orthodontic needs of a non-adult comprehensive patient. An ideal option for teenagers since clear aligners are much less noticeable than traditional braces. Unique features such as six free replacement aligners and compliance indicators are added to ease parents minds when making a choice towards Invisalign treatment.